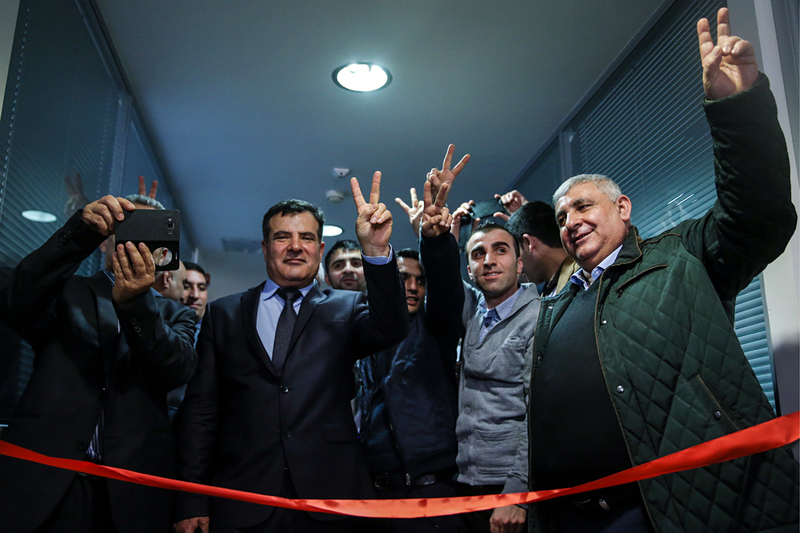 Members of Russia's Kurdish diaspora at the opening of a representative office of Syrian Kurdistan in Moscow, February 10, 2016. For the last two years Middle Eastern Kurds have been making front-page news all over the world. In Syria and Iraq they are successfully fighting against Islamic State militants. Several tens of thousands of Kurds live in Russia and for many of them the war their Middle Eastern brothers are fighting is basically their own. Inside an ordinary building in the north of Moscow, several severe-looking, swarthy men are peering at the TV with tense faces in a dimly-lit room. The anchorwoman is talking in Arabic about the movement of troops in Syria. The men quietly speak with each other about the news. Near the TV hangs an enormous portrait of Abdullah Öcalan, the founder of the Kurdistan Workers' Party (PKK). In Turkey, the U.S. and the EU the party is recognized as a terrorist organization. Since 1999 Öcalan has been serving a life prison sentence on the Turkish island of Imrali. However, for many Kurds he remains a symbol of the fight for freedom. By Öcalan's portrait stand two big flags: the Kurdistani banner and the Russian tricolor. This is very symbolic since we are in the Kurdish House, the meeting place of Moscow's Kurdish diaspora. "My ancestors lived in Northern Kurdistan, which is now Turkish territory," says Vazir Kashakhi, editor-in-chief of the Kurdistan News website. "In 1915, fleeing the persecutions, they moved to Russia and settled here. I was born, studied and have lived here, and obviously I’m Russian. But I’m also a Kurd." Kashakhi used to work in a bank but gradually became involved in the diaspora and then began working at the Kurdish House full-time. According to a 2010 census, more than 60,000 Kurds live in Russia. However, some members of the Kurdish diaspora do not trust the census. According to Kashakhi, many ethnic Kurds live under Armenian and Georgian surnames, which is why the real figure may be much higher. Kurds declare Federation of North Syria u2013 what's next? Historically, Kurds had moved to Russia from Turkey and then, after the collapse of the USSR, from Armenia and Azerbaijan, which were engaged in a war between 1992 and 1994. For this reason Kurds generally live in the south of Russia. According to that same census, most Kurds live in the Krasnodar Territory (840 miles south of Moscow). Kurds are divided not only by distance, but also by religion. Part of Russian Kurds are Muslim, part – Yazidis (an ancient religion with roots in northern Mesopotamia). The Yazidis are forbidden from marrying members of other religions, which is why it is difficult for them to assimilate in Russia. Muslims, on the other hand, sometimes create mixed marriages but not very enthusiastically. “In general,” says Kashakhi, “Kurdish men marry Kurdish women in order to preserve the national hearth." Russian Kurds take the war in the Middle East close to heart: "Even though we moved to Russia, most of our relatives remained there," explains Kashakhi. "Everything that is happening to the Kurds in the Middle East concerns us also." He is convinced that his people is playing an important role in the fight against terrorism. "The Kurds are a barricade that is protecting the world, including Russia, from the Islamist invasion,” he says. The diaspora pays a lot of attention to culture: “We try to organize meetings and cultural events as often as possible. Musicians from all regions come and perform," says Farkhat Patriev, chairman of the Council of Kurdish National-Cultural Autonomy. The Kurdish House celebrates both Muslim and Yazidi holidays and organizes conferences. The issue of preserving their language is particularly important for the Kurdish diaspora in Russia. "Among ourselves, wherever we live and whatever religion we practice, Kurds speak Kurdish," says Kashakhi. Patiev, meanwhile, talks about the necessity of developing education in the national language: "For educating Kurdish children we need books in Kurdish, but Russia only has primers,” he says. Despite the vicinity of the Middle East and its problems, the Kurdish diaspora is fully integrated into Russian society. "There are Kurdish businessmen, deputies, scientists," says Kashakhi. "We are a people that succeeds in everything, everyone finds his own path." Opinion: Why does Moscow need Syrian Kurdistan?